Today's story is about sand, rock and two builders. Jesus was telling a story to explain what it means to obey Him. He explained that when we hear His words and do what they say we are like a wise man who builds his house on the rock. An example of hearing God's words and doing what they say is like hearing in Sunday School that we need to love our neighbor like we love ourselves. Then the next day you notice that one of the kids at school is crying and upset on the playground and kids are laughing and making fun of them. Instead of joining in, you go over and comfort them and play with them. You do what you learned. When you obey what you learn in the Bible God calls you wise! To be wise or have wisdom is not how smart we are but more what we do that's important. When we obey God and listen to him that makes us wise. Of course being wise is a gift from God and we can ask for it when we pray. Getting back to the story. Jesus said that the wise man built his house on the rock. When the rain came down and the streams rose, and the winds blew and beat against the house; it didn't fall down because it had a strong thing to stand on (the rock). The people that hear God's words and doesn't practice them are like a foolish man who built his house on the sand. So, if you learned to love your neighbor as yourself and you didn't do anything to help the kid that was being made fun of on the playground, God calls you foolish. What do you think happened to the house that was built on the sand? Think about what happens when you build a sand castle. Is the sand castle strong? What would happen if it rained and a big wind came? 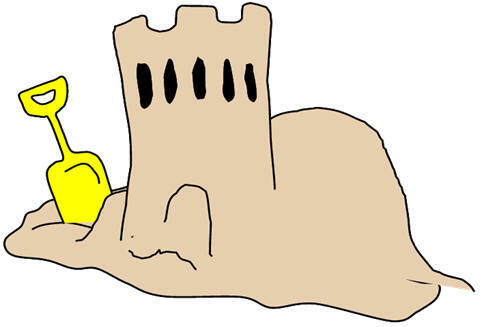 Just like a sand castle, a house can't be built on sand and it comes crashing down. We know that God is the maker of everything, He made us and knows what's best for us. So if he gives us good choices to follow in the Bible and gives us these "rules" they are meant to help us, not to hurt us. God doesn't want to boss us around, He loves us and wants the best for us. He wants us to listen to what he says in the Bible and obey. Would you rather be foolish or wise? If you build your life on obeying God that's like building your life on the rock. We will be strong when situations around us are hard to handle.